Endless plaited round belts from Pflug are perfectly suited to transmit power at low or medium speeds (up to 10,000 rpm). 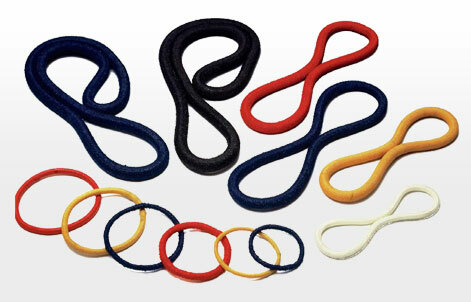 Their design allows very small pulley diameters, with a recommended minimum pulley diameter of 3.5 x the belt diameter. One particular advantage is their ability to be diverted in any direction, this changes of the direction of rotation, multiple-pulley drives, tangential drives and offset drives are very simple to realise. Due to, their linear contact surface key can easily be guided, are track-adherent and run smoothly and quietly outer cover. Gernerally, these belts consist of a reinforcement and the surrounding outer cover which protects the reinforcement and serves as supporting material for coatings or as a friction partner for goods to be conveyed. the mechanical and plant engineering industries. Models with limited extensibility are primarily used for conveying applications or other special tasks. The spectrum of reinforcements ranges from semi-elastic fibres up to V4A. As endless plaited round belts are predominantly used as force-fit transmission elements, the tensile force that can be achieved together with the friction coefficient are crucial aspects to achieve maximum transmission capacity. Thanks to their multi-component design and the raw materials we use, we are able to strengthen the basic versions of elastic models by up to 300% without substantially changing the diameter. 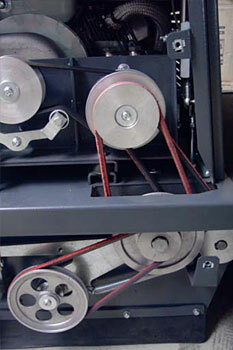 As a result, tensile forces of up to 300 n are possible even with 5 mm belts. The coating is selected depending on the respective application; usually, it serves to protect the outer cover, improves abrasion resistance, increase the friction coefficient and thus improves transmission capacity. We can also provide the belts with multiple coatings to increase abrasion resistance or achieve a highly smooth surface. We gladly to discuss your respective application with you and recommend the version that suits your requirements best.